Don’t worry, we are not getting that big headed! Complimenting your dress and the designer’s athletics is really important for the overall effect of your wedding outfit. Therefore it is often a good idea to have a clear understanding of the dress that you have chosen, or are dreaming of, before searching for that perfect pair of wedding shoes. Although we would always like to put the shoes first (and then base the dress around them) you will undoubtedly get a better result if you chose your shoes to compliment your dress. Exploring the era that your dress, venue and personality inspire is a fantastic way of complimenting your day. If you have a slinky 1920’s Hollywood style dress then looking for clean, classic shoes with a modern twist will help to enhance the overall look without detracting from your beautiful dress. We have found that a peep toe or t-bar shoe often works well with this style. Alternatively, if you are having your wedding within a place of worship it can be important to the venue that you wear a closed toe shoe, therefore it is always best to think about your final outfit with the venue in mind. When you are looking at your shoes for a long dress its important to consider what will be seen from under your dress; normally the first two inches of the shoes will show when you are walking. It is important to think about the details of the shoes that will be on show, whether that is a shoe clip detailing or the perfect pedicure to match your colour scheme, and how they will work with your overall look. A short dress means a whole different level of freedom in the way that you chose to express your style through your shoes. We find that most brides with a shorter dress want to really show off with their shoes, as this is a very visible part of their bridal outfit. 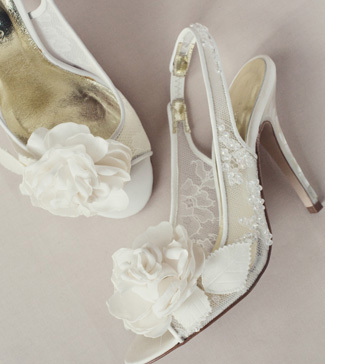 Working with your designer you can get recommendations of which footwear designers complement the dress best. Complimenting the dress and theme of your wedding is all in the detailing and styling. For example, if you have silver beading in your dress you can pick up on this within your choice of shoes. Coloured detailing from silver leather to bespoke embroidery, made to mimic that of your dress, can hint to these elements. Pairing a structured dress with clean-cut and more structured style shoes is the simplest way to compliment your dress; whilst a more romantic and ethereal style dress would be beautifully complimented with light shades of ivory and pink and beautiful embellished floral aspects of the shoes. We think that complimenting your dress, venue and overall look is very important but most important of all is being true to yourself. If you want to wear bright pink shoes go for it because at the end of the day your wedding is one big representation of you both as a couple!